Alcohol is the most widely abused substance by kids under 21 years of age. Prescription pain medication would be next on that list. Imagine, one product that can help you discourage your kids from both of these dangers in your own home . It's here, it's simple to use, and it’s affordable. What is it? The Bottle Blocker! 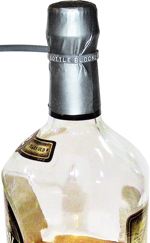 A disposable tamper proof lock that fits ANY liquor bottle or pill bottle to prevent unauthorized access. It's patent pending, made in the USA, and available now. The tamper proof lock is a simple 2-part device made up of a custom latex cap that stretches to fit over the top of the bottle. The material is made to cling to the bottle. Once in place a custom locking tie with the name Bottle Blocker imprinted on it locks it in place. It's that simple. It will work on any bottle with a neck. It will even work on bottles of cleaner or other poisonous materials under your sink to help protect inquisitive toddlers. This ingenious device works by setting up a tamper proof barrier that has to be cut off in order to gain access to the bottles. A simple snip of the locking tie and your in. BUT, once removed it can not be reused. That means if your kids get into something they will get caught. That's the beauty of this device. No kid wants to get caught. If they know you will catch them then they won't go there in the first place. And their friends won't be able to talk them into it either because the fear of getting caught is a serious deterrent. So your interested, how can you get it and what does it cost? You might be interested in our Deluxe Kit that comes with the 24 tamper proof locks, and a cutter, enclosed in a metal locking box that keeps those supplies out of reach. You can even fit a few pill bottles in there if you have tempting medications that you don't want to seal and unseal. This deluxe kit is available for only $49.95. So what are you waiting for? Don't wait for your child to be a statistic. Take an active stance against underage drinking and drug abuse in your home. Get the Bottle Blocker today! 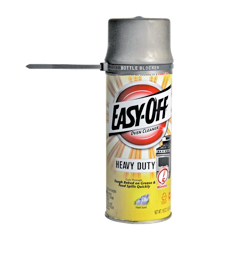 Is a disposable tamper-proof lock that fits ANY liquor bottle or pill bottle to prevent unauthorized access. It's patent-pending, made in the USA, and available now.